Essentials of Oral Histology and Embryology: A Clinical Approach 4th Edition. James K. Avery and Daniel J. Chiego help us to understand normal orofacial development to prepare you to care for patients with abnormalities or dental pathologies. It provides a strong foundation in oral biology, focusing on the development and structure of cells and tissues, the stages of tooth development and maturation, and the parts of teeth including enamel, dentin, dental pulp, and cementum. New illustrations and discussions of emerging issues keep you current with advances in the dental professions and patient care. 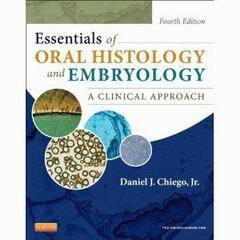 Written by Daniel J. Chiego Jr., an experienced educator in oral histology and embryology, this book provides the basic science you need to succeed in the classroom and in clinical practice. Clinically focused content provides essential knowledge of the basics of oral biology with an emphasis on its relationship to clinical practice and a focus on the patient. Full-color art program includes many high-quality illustrations, histographs, micrographs, and clinical photos depicting various stages of development of the oral structures. Clinical Comment and Consider the Patient boxes help you apply information to clinical practice and patient care by describing clinical tips, points of interest, and patient situations. Self-evaluation questions are included at the end of each chapter, helping you review for classroom and national board exams. Key vocabulary is listed at the beginning of each chapter and highlighted in boldface within the text. Suggested readings at the end of each chapter allow you to research classic and new studies.An Evolve companion website provides practice quizzes, vocabulary flashcards, labeling exercises, and links to related websites for further research and study. New content on thyroid development and hormones, tooth development, dentin, collagen, and cemental repair incorporates findings from recent studies. Updated art program accurately depicts the anatomy of oral and facial tissues and provides high-quality images to help improve comprehension.